There have been many times when I've been programming, encounter a problem that probably involves a loop of some sort, and I think of two or more possible ways to achieve the same end result. At this point, I usually think about which one will probably be the fastest solution (execution-wise) while still being readable/maintainable. A lot of the time, the essentials of the problem can be tested in a few short lines of code. A while back, I was perusing some Stack Overflow questions for work, and I stumbled upon what I consider one of the many hidden jewels in Python: the timeit module. Given a bit of code, this little guy will handle executing it in several loops and giving you the best time out of three trials (you can ask it to do more than 3 runs if you want). Once it completes its test, it will offer some very clean and useful output. I had no idea which would be faster, so timeit to the rescue!! Open up a terminal, type a couple one-line Python commands, and enjoy the results! Hah, the list comprehension is certainly slower. This is useful when your code is calling other functions or methods and you want to find where your bottlenecks are. Hooray for Python! What profiling techniques do you use? 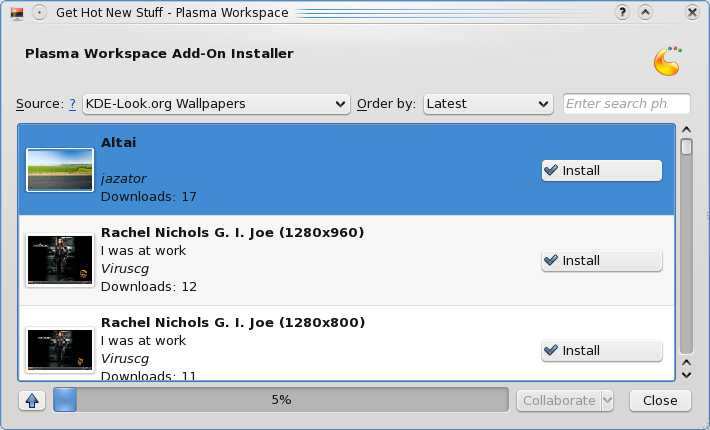 The installation for Fedora 11 went pretty smoothly. I began the installation around 11:10PM on June 10th, 2009. I did a fair amount of customization with my partitions and package selection, so the exact timing for installation is probably not a very fair figure to place here. But I'll share some numbers anyway, for my own benefit more than yours. The timing seemed pretty typical of an RPM-based distribution to me. After the installation succeeded, it asked me to reboot. I noticed that the installer didn't eject the DVD when it was ready to actually reboot, so I just left it in there for kicks. When the DVD's boot menu came up, it showed a list of a few boot options, one of which was to boot from a local drive. I selected the local drive option, but it failed--it apparently decided to look for a non-existant PXE server. Ejecting the DVD and rebooting again rendered the actual Fedora bootloader that was installed to my hard drive. It automatically launched Fedora after 5 seconds or so. The boot screen is nice and pretty... none of the classical progress bar business, but rather the circular shape that makes up the Fedora logo. As the boot process proceeded, this shape was filled in a diagonal, bottom-left to top-right fashion. I like that. Next, it presented me with a "Welcome" screen that said something about there being a few more steps before my system would be ready to use. 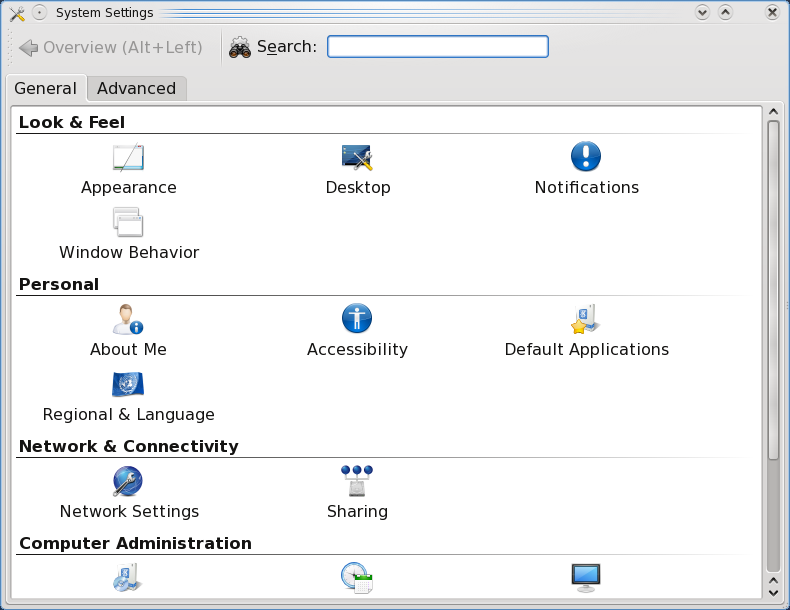 These steps included a license information page, creating a regular, unpriviledged user, setting up the date and time, and an optional "send hardware profile" page. I opted to send my hardware profile just because I know what it's like to not have information like this when you're trying to figure out problems your users are having. You should be aware that opting in on the hardware profile submission enables a monthly submission, not just a one-time submission during setup. After all that was done, I was presented with a login screen and a fairly ugly background. I will probably be changing that one. After logging in, the loading screen seems pretty slick... It has a fancy little progress dealy unlike no other I've seen before. Almost as impressive as the boot up screen, if not more so. 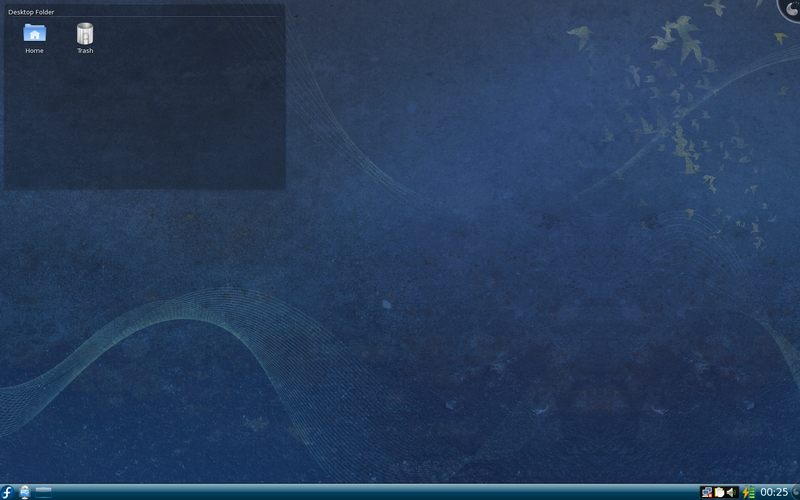 My default background was the same that was used on the login screen. It was the first thing I decided to try to change. 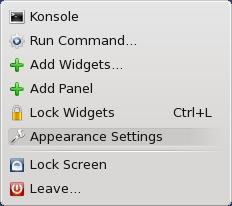 Clicking the Fedora button in the bottom-left corner of the screen pulls up the new KDE menu (which is going to take some getting used to for me). 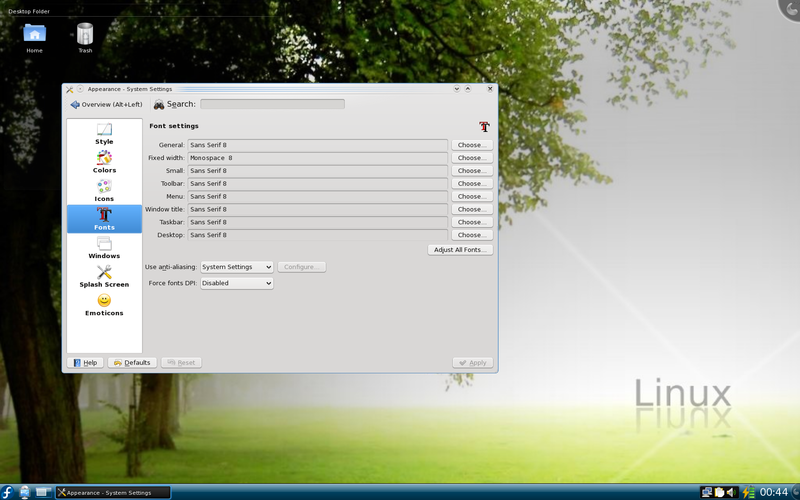 The initial menu showed a "System Settings" option, which is what I used to change the background image. On the screen that loaded immediately after selecting "System Settings," I was presented with several icons that seemed like they would do the trick. Well, after a little poking around, I decided it might be easier to just right click the desktop to see if the context menu had any suspicious items for changing the background. Lo and behold, I found an "Appearance Settings" item. That was the ticket. Disappointment. Utter disappointment. When I went to select a new background image, I discovered that there was only one to choose from--the nasty default one! I tried clicking the "Get New Wallpapers..." button, but all that did was tell me I had network problems. There was a nice little icon in my system tray that suggested it was a network manager, so I clicked on it. I suppose Fedora detected my Ethernet adapter just fine, as it was an option in the menu that popped up when I clicked the icon. My Broadcom wireless adapter apparently was not detected. Still, I find it curious that Fedora didn't connect to my Ethernet automatically (the cable was plugged in the entire time). Clicking the eth0 item in the menu was painless, though. It connected me directly to my network with no additional fuss. The "Get New Wallpapers..." button that I mentioned previously seemed to work a bit better after having connected to the network. When I clicked it, though, I was presented with a screen that apparently wanted me to do something before it would do anything for me. After waiting for a few seconds (because I was typing this), things started happening. New backgrounds started to appear, but there was no indication of any activity. I found that rather strange. Selecting a few background images that looked appealing from their thumbnails was pretty straight-forward. The actual download, however, was less than impressive... either the server is overloaded with activity, or the images are very large, because my connection is quite idle right now. 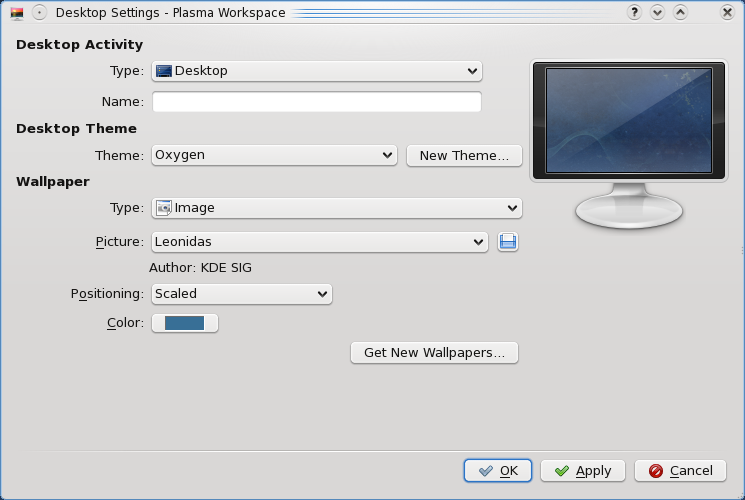 It seems that all of the backgrounds that appeared are all of the classics from kde-look.org that were available in my trusty KDE 3.5. This is good. The next change I felt I must make before proceeding was reducing the size of the fonts. They are much too large for my preferences. Back to the System Settings I went. This time, the "Appearance" icon was the one that proved to be pertinent. Fedora's default font size was 10-point. I changed them all to 8-point. Things felt a lot better after doing that. 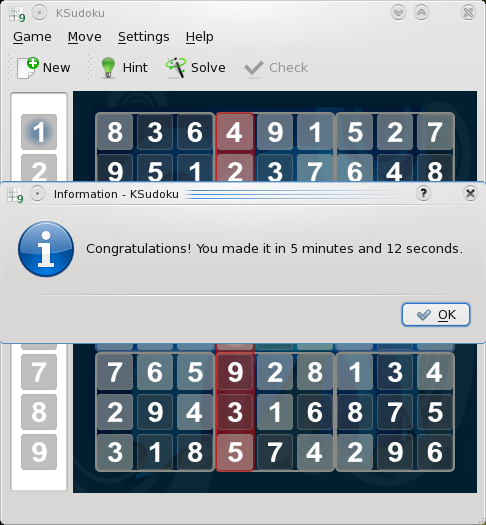 Now that it's close to bed time, I feel I must close this section with the requisite game of Sudoku :) The new KDE menu setup is really, really going to take some getting used to. 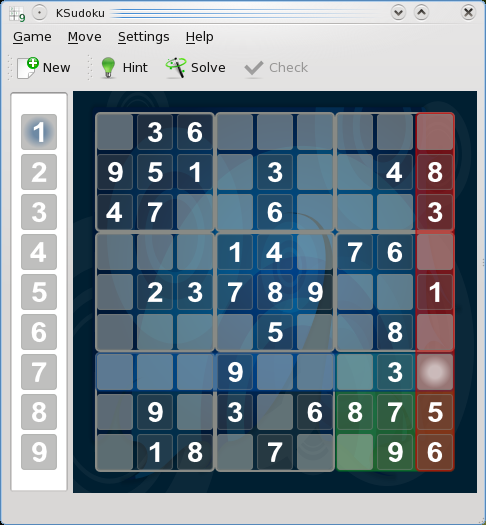 I found Sudoku under Applications > Games > Logic Games > Sudoku Game. I thought I would share with all of you a little trick that I've been using for quite some time in my Django applications. Personally, I find it to be very convenient and simple. That seems all find and dandy, right? Just a simple call to get_profile() isn't that difficult. However, if there is not yet an instance of whatever you set AUTH_PROFILE_MODULE to for the user in question, you'll get an error about it when you call get_profile(). (with no parentheses after profile) The get_or_create method tells Django to look for any UserProfile objects whose user attribute is the user from which you are accessing the profile property. If no matches are found, an instance of UserProfile is created for you. The lambda function returns the UserProfile instance in both cases. This trick is very simple. It's also very effective in my experience. I'm sure there are other ways of doing the same thing, but this works for me, and it's just one line of code--no need to even specify the AUTH_PROFILE_MODULE setting! You can apply the same trick to pretty much anything if you'd like. It doesn't have to be just for user profiles. Enjoy! Today I was working on a USA ePay payment module for Satchmo. I had access to some work done by another chap, but I wanted to get a better feel for what needed to be happening in the payment module, so I examined some of the stuff that other people had done as well. I studied the "official" PHP version of the payment module for a little while. Things seemed pretty self-explanatory, so I decided I might as well translate the PHP library into Python. <sarcasm>Wow, yeah... PHP really does rock! It must be the coolness factor behind the ternary operator they use! The Python code is just horrible compared to the PHP code. case 3: //JCB - Um yuck, read the if statement below, and oh by the way 300 through 309 overlaps with diners club. bummer. case 4: // Visa - First digit must be a 4 and length must be either 13 or 16 digits. case 6: // Discover - First four digits must be 6011. Only valid length is 16 digits. I'm so glad I was able to escape the grips of PHP.